Howard Sengstack is a guitar instructor with over 16 years of private teaching experience. He teaches classical, acoustic and electric guitar, as well as bass guitar to students ages 6 to adult. Howard enjoys teaching various styles of music including rock, blues, jazz, classical and country. In addition to teaching music fundamentals, Howard has a strong interest in music theory and incorporates it in a straightforward manner that is appealing to students. He is also happy to help students progress in their school ensembles as well as their own extracurricular bands. Howard has an Associate of Arts degree in music from Montgomery College and a Bachelor of Arts degree in guitar performance from Shepherd University. Howard has experience playing in big bands, jazz combos, country, blues and rock bands. He also performs solo classical guitar, and as part of a classical duo, for a variety of events. 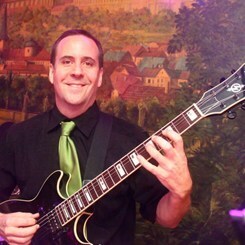 In addition, Howard is the guitarist for Retrospect, with whom he has been performing at weddings, corporate and charity events for over 10 years. When he is not teaching or playing the guitar, Howard enjoys skiing, hiking and biking. Request Lessons with John Howard today!